Mikayla Patton was halfway through high school before she had the chance to take her first art classes, first in photography and then in drawing. But her teachers immediately recognized her talent and encouraged her to keep working. And one teacher eventually helped Mikayla enter her pieces in a show at the Heard Museum in Arizona, one of the country’s most prominent Native art museums. One of her pieces sold—and she was awarded a scholarship for college. She knew then what she wanted to do with her career—and her life. Flash forward to today, and Mikayla—at just 26 years old—is already taking the art world by storm. She has entered her work in the last three Red Cloud Indian Art Shows and won awards for the most improved and best young artist. And this year she won an emerging artist award during her first showing at the Native POP: People of the Plains exhibition in Rapid City. The recognition, she says, is both surprising and exciting. In the years since high school, Mikayla has followed a path of her own, but always stayed focused on exploring her craft. After graduating from her boarding school, she spent a summer earning college credits at the Indian University of North America, a prestigious program created by the Crazy Horse Memorial Foundation and the University of South Dakota. During that summer, she decided she wanted to attend the Institute of American Indian Arts (IAIA) in Santa Fe, New Mexico. And as soon as she arrived, she knew she’d found another home. After that first year Mikayla had to take a break from IAIA because of the cost of tuition—but she stayed deeply connected to her work in the arts. Someone told her that The Heritage Center was hiring interns, and soon after she was hired by The Heritage Center’s then director Mary Bordeaux. 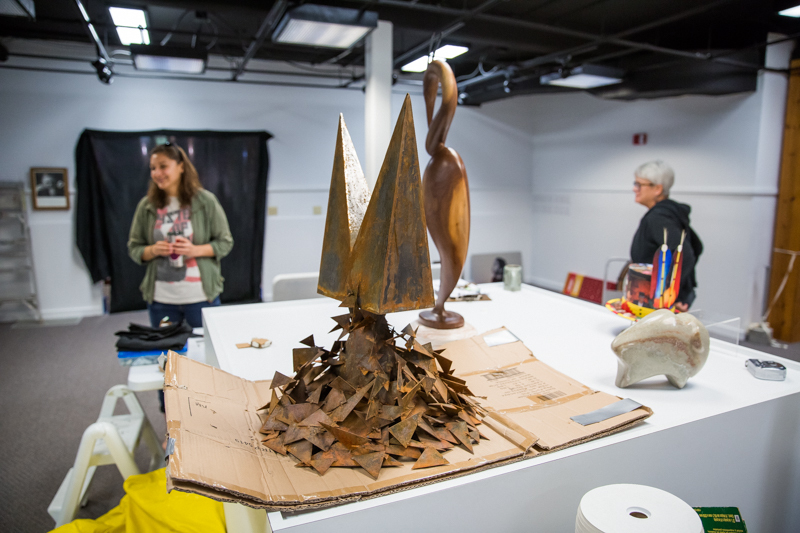 She made her way back to IAIA—and this year she entered three pieces in the 49th Red Cloud Indian Art Show that she created through her latest studio classes, focusing on sculpture and printmaking. The print she entered features a buffalo, and Mikayla explains that it speaks to traditional imagery and the importance of the animal in Lakota history. She also incorporated circle and triangle designs into the print that are often used in traditional Lakota beadwork. But the style itself is very contemporary—and represents Mikala’s own modern interpretation of traditional culture. She was thrilled the print was purchased to be a part of The Heritage Center’s permanent collection. 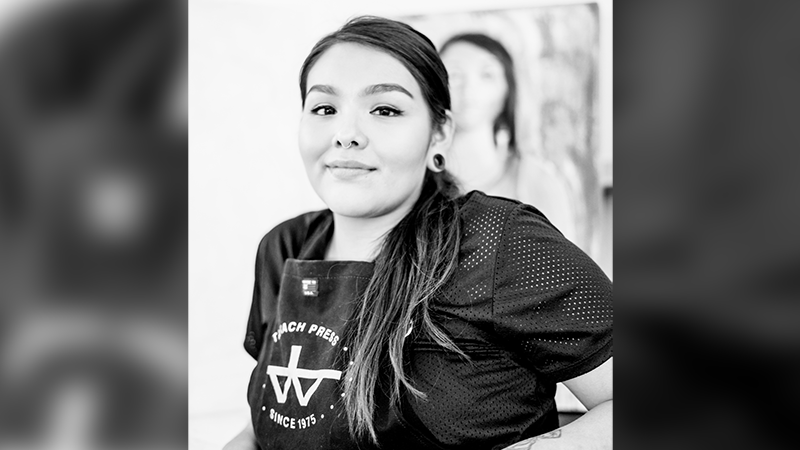 Looking forward, Mikayla will graduate from IAIA in the fall of next year—and for now she plans on returning to Rapid City, to be a part of a growing community of Lakota artists. She’s also starting to explore more traditional forms of Lakota art, by incorporating beadwork into her paintings and even creating her own jewelry. While Lakota culture has always informed her work, she says exploring these mediums is another way to understand her heritage. As an emerging artist just launching her own career, Mikayla knows the challenges that face other Native artists who want to pursue a life in the field. Her advice is to follow that passion for the arts—but to reach out and ask for help to make your way forward.